Sometimes a movie can be so clever and so fun that you can completely disregard the fact that it is utterly devoid of meaning or logic. By the time we hear Brad Pitt’s character Tom Bishop ask, “What’s the name of the operation?” and the response is, “Operation Dinner Out, sir!” we have been so perfectly enthralled by the performances of Pitt and Robert Redford that we can easily set aside the absurdity of what is happening on screen. Bishop is a CIA operative who has gotten himself captured by the Chinese. Redford’s Nathan Muir is his superior. The film is about their history together and Muir’s attempt to free Bishop. I watched the movie with my girlfriend, and while she enjoyed it, she remarked afterward that she would need to see it again to really understand all of the twists and turns. I have seen it three times now, and I still don’t have a full grasp of all the phone calls and cutaways and violent edits. This aspect, rather than being a distraction, is one of the film’s virtues. The idea is that Redford’s Nathan Muir is so smart that he is hoodwinking the CIA. Part of the game that the movie plays is that we the viewers are given just enough of a hint that we can appreciate his cleverness, but even we aren’t intended to fully “get it”. Tony Scott’s hectic, pulse-pounding visual style is largely responsible for this mesmerizing and confusing effect. Similar to (but far superior to) Guy Ritchie’s penchant for seemingly random visual tampering, Scott hits more often than he misses in Spy Game (though he definitely misses with an awkward and repeated “time stamp” effect). Scott has a well earned reputation as a violent director. He loves violent characters and dangerous scenes and his visual effects and editing are just as virulent as the oft-seen machine gun fire. Partner that with a taste for “cool” Hollywood endings and he has had some nice success with fun action films like Crimson Tide, Enemy of the State and Spy Game. One qualm is that Scott tends to drag his actioners on for too long. There is a touch too much dialogue, a few too many chase scenes; the films are tight, slick, hour-and-forty-five-minute action films stretched to two hours (or more). This tends to dull the edge of the cleverness and the pop of the one-liners. Luckily, Scott usually works with top-notch charsimatic leads like Pitt and Redford, Hackman, Denzel Washington and Tom Cruise. These actors can carry even bad scripts pretty far (and they often end up doing just that). Spy Game was made before 9/11 but released soon after, in November 2001. Given the subject matter involving suicide bombing and assassinations of Middle-Eastern warlords, it may have been too touchy to have gotten much press at the time. I certainly do not remember hearing much about it. The film asks of the audience a certain blind confidence in the intelligence and power of the CIA and its operatives, something that was very common prior to 9/11. Immediately after that distaster, and even to this day, the aura of American invincibility has been tarnished. Nonetheless, my most recent viewing, some nine years after release, was as least as fun as if the story had been more realistic. This entry was posted on June 12, 2010 by Ian Kay. 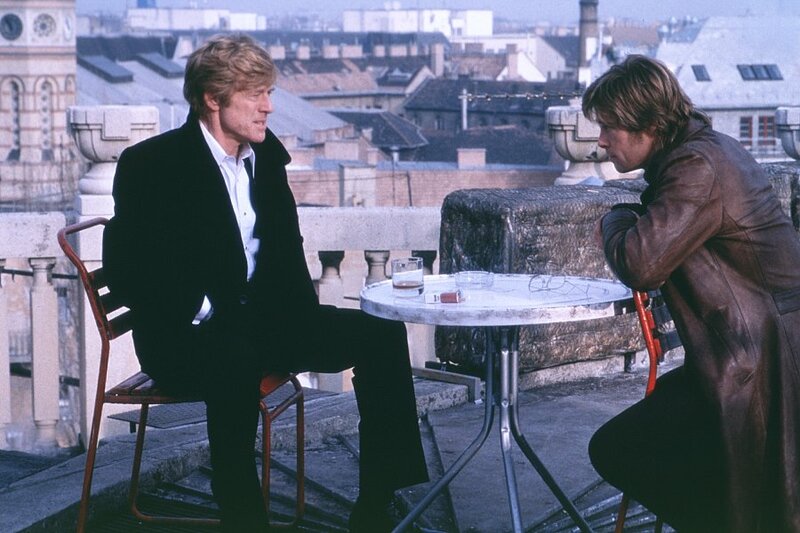 It was filed under Spy Game (2001) and was tagged with brad pitt, robert redford, spy game, tony scott.